Any Yorkie lover sooner or later has to come to grips with the issue of coat care. 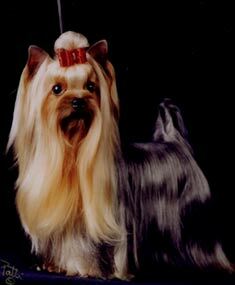 The long luxurious tresses of the champion Yorkie are not easy to reproduce in the average home setting. Most will prefer to adopt a lower maintenance clip such as the puppy cut or the Schnorkie look, which is really just a modified Schnauzer cut. Whichever style Yorkie you prefer, the important thing is to introduce your puppy early and often to the concept of bathing and brushing. For the first six months, don't let a day go by without at least a quarter hour of brushing, and it is even better if you can actually shampoo your bundle of fur several times a week. The first few bathing adventures will have you wondering if these little critters are actually part cat, but gradually they do become accustomed to the event and their behavior will improve dramatically. For those wishing to grow their Yorkie's coat out, there is no better advice than the step-by-step instructions on Cookie Rogan's website, a portion of which I have reproduced here. Visit Cookie's site for lots more in-depth coat handling and general Yorkie care. For the average Yorkie owner, it is enough to know that a daily brushing and a weekly bath with a high-quality dog shampoo will keep your Yorkie gleaming. If you can also shave both sides of the top one-third of the Yorkie puppy's ears with a Wahl Tidbit and carefully trim the nails yourself, you will save yourself a bundle on groomers. For complete illustrated adult dog toenail trimming instructions visit WSU Veterinary Medicine College's Pet Health Topics. However, for a Yorkie puppy's tiny nails, don't bother to purchase any special equipment. Use a regular human toenail clipper available at any chain drugstore. Before attempting to trim your puppy's nails, use your Tidbit clipper to trim away the hair from its toes. You will have a lot more confidence and do a much better job if you can actually see the toenails, unobstructed by hair! Keeping the hair trimmed away from the toes and pads of the feet also means your puppy (and your house) will stay cleaner, because there will be nothing for dirt and debris to stick to and get carried into the house on. Since Yorkies have black toenails, it is difficult to see where the quick begins. However, if you look at this photograph, you will see that the nail begins to curve right where it should be trimmed. As long as you cut off only the curved portion of the toenail you will never cut into the quick. First make sure your Yorkie is flea free. One flea on a Yorkie will ruin the coat. They scratch and make a tangled mess of themselves. There are many new kinds of flea control on the market now and if used, will work. Never brush a dry coat. It breaks hair. I use "Coat Gloss" made by Ring 5. It is a lusterizer, conditioner. I spray it on my brush (a Mason Pearson nylon 7 inch) and brush one section of the coat at a time. Another good spray product is "Miracle Coat". Always start from the bottom of the hair strand and work upward toward the body. If you encounter any mats along the way, use a pin brush (P.S.I. 25249) to get them out. You can also use a slicker brush (any small one) for the really tough mats. I usually only use the slicker on puppies. Don't use the slicker on the thin coated dogs. Instead use a wide tooth metal comb. Any mat or knot should be treated gently. Don't rip through the hair. Gently pick as much apart with your fingers as you can and work from the ends up to get the mat out. I believe in the weekly bath. Some breeders I know say every two weeks. I think it depends on your Yorkie. If he's dirty, bathe him. Some of my "mud puppies" get two a week. The worst thing next to fleas for the coat is dirt. First I brush until all the tangles are out. Pay particular attention to under the arms, legs, neck and behind the ears. I use an ear cleaning solution (any brand) in their ears and gently with a q-tip clean them out. If there is any hair in them, this should be removed. A hemostat works great but you can also use tweezers. Too bad if you're squeamish. Those hairs have to go or your pup could get an ear infection. Also I treat for ear mites once every three months, just as a precaution. Next check toenails. If they are too long, cut them. I know, you're gonna say "but what if I make them bleed?". There is a product called "Quick-stop". If they bleed: First, "don't panic". Second, just dab a little Quick-stop on the toenail and it stops the bleeding right away. You can also use it on yourself for the teeth marks your Yorkie left on you for cutting his nails too short. A good guide is the curve in the nail. I hold the clippers flat against the upper part of the nail and whatever curves down into the clippers gets cut off. The next thing I do is check their teeth. I brush their teeth before every bath. I use the toothpaste I get from my vet and a baby toothbrush. Sometimes they get built up tartar and I use one of those teeth cleaning tools I get from my supplier to scrape them clean. Afraid to do it yourself? OK call your vet. He'll do it for about $100-$500. If your vet does it, get him to check your Yorkies teeth about once a year. But you can brush them yourself. Next, pull up top coat so only the leg hair is showing. Pick up one foot and trim all hair off the pads and cut hair in a circle around the foot. If you're not showing and your Yorkie has a lot of leg hair go ahead and shave the whole foot with the clippers. Just don't go too high up. Then pull leg hair down to just above floor length and cut in a circle. You want it above the floor so he doesn't trip on it. When you pull the body hair down, it doesn't show. The idea is to get the hair off his feet so he doesn't trip or slip. The body hair is cut a little longer. I comb the hair straight down and with my palm facing the dogs body I put the hair between my index and middle fingers like they are a pair of scissors. I bring my hand straight down to the table and lay my palm flat on the table. The ends of the hair are sticking up between my fingers. I cut about one fourth inch above my fingers. For a semi-show cut, (a cut that looks long but easier to take care of) I use an Oster clipper with a 4F blade and start at the top of the neck and push the clippers toward the rear of the dog. If you want the hair shorter use the same blade but start at the tail and push the clippers toward the neck. I cut all the blue but leave the gold. I also cut the tail hair off. On the sides I just cut a straight line between legs halfway between body and floor, without cutting the leg hair. You can ease the clipper down on the sides to taper the hair. I cut the muzzle to 1" but taper longer toward the back to blend in with the neck hair. Sometimes I leave the topknot about 6" long so I can still put a pony tail in. This is how all my boy's are cut once they're finished showing and they love it.